SALE $1,699 More Finishes. Same Price. SALE Starting at $2,999 More Finishes. Same Price. SALE Starting at $1,699 More Finishes. Same Price. Romantic silhouettes and handcrafted beauty make our collection of dressers and bureaus the envy of the furniture industry. Handcrafted with painstaking attention to detail, our artisan furniture builders take great pride in their ability to create beautiful furniture pieces for you to enjoy for years to come. Your bedroom dresser has an important place in your room. It must be functional, full of carefree storage, and also be beautiful. The wood grains and rich finishes add a natural harmony to a space where you can get away from it all. Together with the artisan furniture builders at Bassett, you can create a soothing, warm atmosphere to relax and retire for the evening. Come on down to your neighborhood Bassett showroom - and don’t forget to put on your designer’s hat. Our custom design program enables you to choose your own finish and hardware. At Bassett, you call the shots. Make an appointment to see one of our helpful design consultants to discuss your ideas. Use our easy online appointment booking or stop by a nearby showroom. Let’s create your next, great family heirloom. 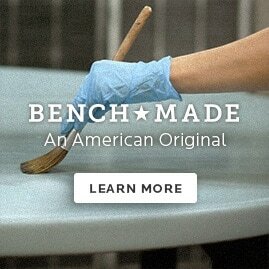 Made entirely of solid wood, our Bench*Made bureau is made by our artisan craftsmen right here in Bassett, Virginia. Created from hardwood lumber sourced in the Appalachian Region, Bassett’s Bench*Made dresser is distinctly American and built to last a lifetime.